Kazakhstan's President Nursultan Nazarbayev hailed the China-proposed Belt and Road Initiative as a "great idea" in an exclusive interview with CGTN recently, saying that the initiative has contributed a lot to his country and enterprises along the Silk Road Economic Belt. "Today it's okay to say that this is a great idea," he said. "It is applicable to all countries." Nazarbayev explained that many countries hit by the global economic turmoil in recent years have benefited from the initiative, including Kazakhstan. The initiative is helping increase the Central Asian country's revenues and boosting its businesses, he noted. 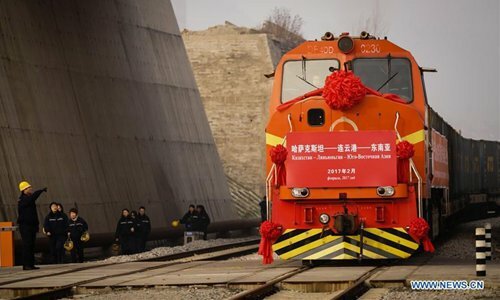 Proposed by Chinese President Xi Jinping, the Belt and Road Initiative comprises the Silk Road Economic Belt and the 21st Century Maritime Silk Road, and aims to build trade and infrastructure networks connecting Asia with Europe and Africa along and beyond the ancient Silk Road routes. It was during his visit to Kazakhstan in September 2013 that Xi first suggested building the Silk Road Economic Belt. China and Kazakhstan are both founding members of the Shanghai Cooperation Organization (SCO), and the east Chinese city Qingdao will host the SCO Summit in June. "I believe the preparations for this year's summit will be conducted orderly under the leadership of President Xi Jinping," Nazarbayev told CGTN. "Kazakhstan is actively cooperating with China in this regard." Last year, the 17th meeting of the Council of Heads of State of the SCO was held in the Kazakh capital Astana. The upcoming Qingdao summit will be a "fruitful" meeting, during which leaders of SCO countries will "draw a blueprint for the future" of the organization, the Kazakh president added. "I am very supportive of the SCO," he stressed. Since its founding in 2001, the SCO has become an important platform for maintaining regional safety and stability, and for promoting common development and prosperity. Member states have been making efforts to align their development strategies. "Now the organization is not merely a political community but also an economic one," Nazarbayev said. "With joined hands, we work to promote the economic development of member states." Kazakhstan is also cooperating with China in the fight against extremism, terrorism and separatism, according to the 77-year-old president. Nazarbayev described his Chinese counterpart as an "old friend." "President Xi Jinping is an old friend of mine. We meet each other every year to exchange views," he said. China and Kazakhstan forged diplomatic ties in 1992 and the two countries are now comprehensive strategic partners. In recent years, the two sides have been expanding production capacity cooperation and diversifying trade. During Xi's visit to Kazakhstan last June, Chinese and Kazakh enterprises and financial institutions signed 24 deals worth more than eight billion US dollars. 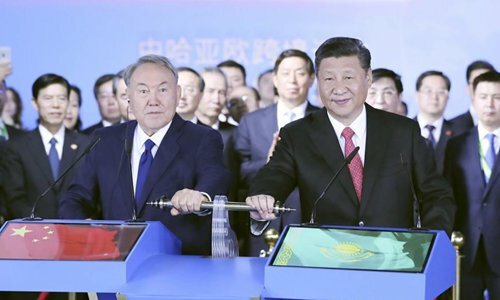 "I am proud that China and Kazakhstan can trust each other and that our people live in peace and stability," Nazarbayev noted, calling Kazakhstan a "good neighbor and friend" of China. Commenting on the 19th National Congress of the Communist Party of China (CPC) held last October, the Kazakh president said the rejuvenation of the Chinese nation - a mission that China's ruling party highlighted at the meeting - is also significant to the world. During the landmark congress, the CPC added "Xi Jinping Thought on Socialism with Chinese Characteristics for a New Era" to its Constitution. Nazarbayev believes that Socialism with Chinese Characteristics reflects the thinking of Eastern countries. "It will definitely push forward China's development," he stressed.